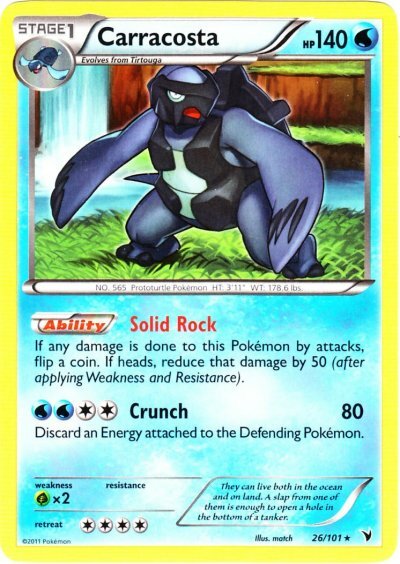 Ability: Solid Rock If any damage is done to this Pokemon by attacks, flip a coin. If heads, reduce that damage by 50 (after applying Weakness and Resistance). Attack #1: WWCC Crunch (80) Discard an Energy attached to the Defending Pokemon. Card Text: Ability Solid RockIf any damage is done to this Pokemon by attacks, flip a coin. If heads, reduce that damage by 50 (after applying Weakness and Resistance).